Those of you familiar with Chicago Children’s Museum know that we’re strong advocates of play. See our resident expert Tsivia Cohen’s past blog post on the topic. Play contributes to the cognitive, physical, social and emotional well-being of children and youth. The United Nations High Commission for Human Rights recognizes play as the right of every child. With the recent opening of our Forts exhibit, we’ve been thinking a lot about imaginative—or pretend—play, in particular, and its importance in developing young children’s social, language and problem-solving skills. In an interview with the American Journal of Play, Dorothy and Jerome Singer, experts in the field of imaginative play, explained why make-believe play is so important for children. Pretend play is the act of creativity. The child engaged in pre-tend play is engaged in what Piaget called ludic play. She’s playing a game, and by taking a piece of mud and pretending that it’s a birthday cake and putting candles on it, she’s using her imagination. She is differentiating between what is real and what is not real. She knows that this is mud she’s playing with, but it becomes the cake. She knows that a broom is something that you sweep the floor with, but when she wants it to be a horse and rides it, then in her imagination it’s really not a broom but a horse. At first glance, Forts is a large, bright room filled with usual—and not-so-usual—fort-making materials. But it’s much more than that. 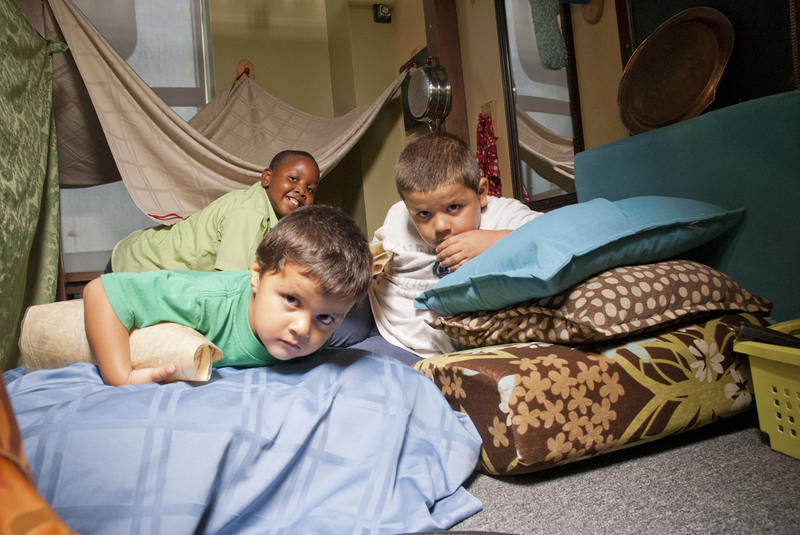 Specially designed by CCM’s in-house education and exhibit experts, Forts is a rich, immersive environment that inspires imaginative play in children of all ages—and quite a few adults! 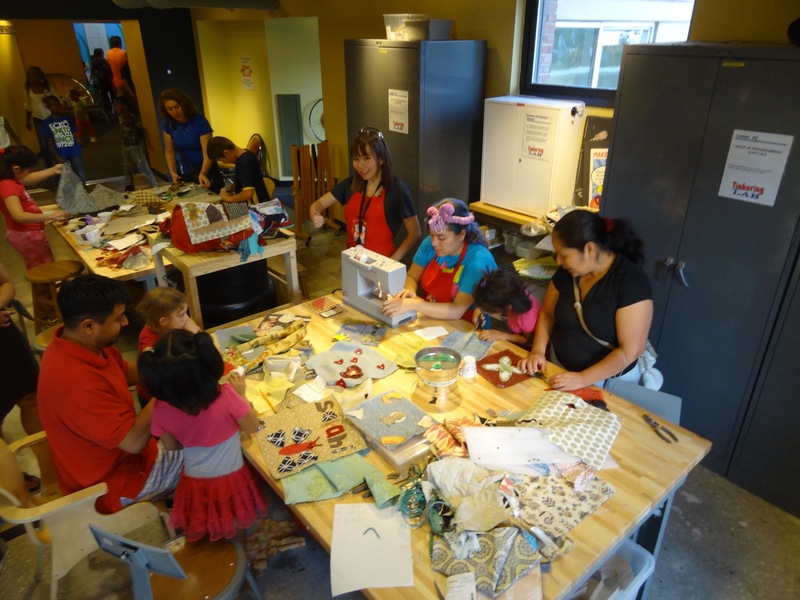 Tinkering Lab at Chicago Children’s Museum is a workshop of freedom and flexibility. Families enter the space and instantly start to understand that this is a place where they will have the chance to work with real tools and materials in whatever way they see fit. After a little bit of time becoming saturated in the space, children start gathering supplies. Each person begins to formulate ideas of what they will do, what they will make. They draw inspiration from previously completed projects, materials available, and whatever else is going on the space . . . and then the work begins. 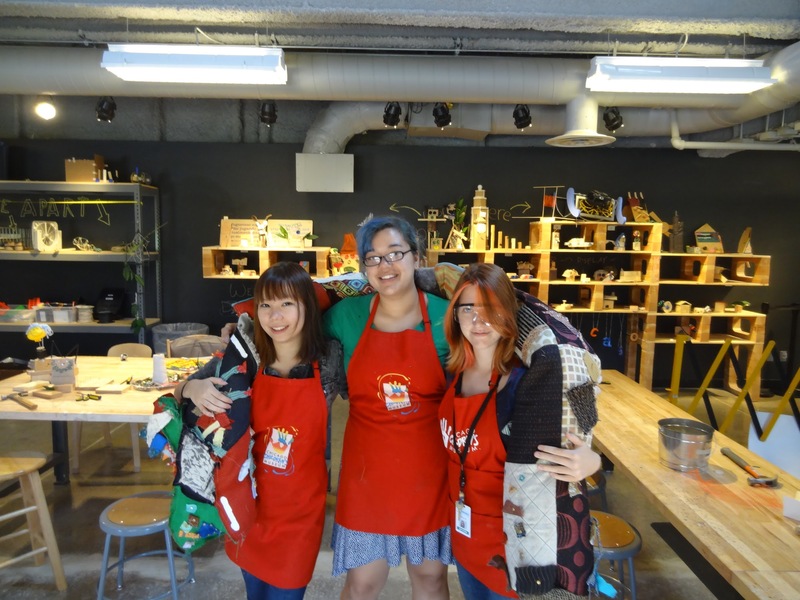 Through the Maker Education Initiative, three Maker Corps Members worked in the Tinkering Lab from mid-June to mid-August. Heather, Andrea, and Kaity immersed themselves in the idea that when we trust children with real tools they show great competency. All three Maker Corps Members proved to be supremely adept at letting children explore a tool, while simultaneously ensuring their safety. Providing the “just in time” information that enhances a child’s exploration takes a thoughtful person, with the ability to see the whole child. The facilitator has to read the child’s body language and keenly observe while making sure the child has plenty of physical, emotional and mental space. 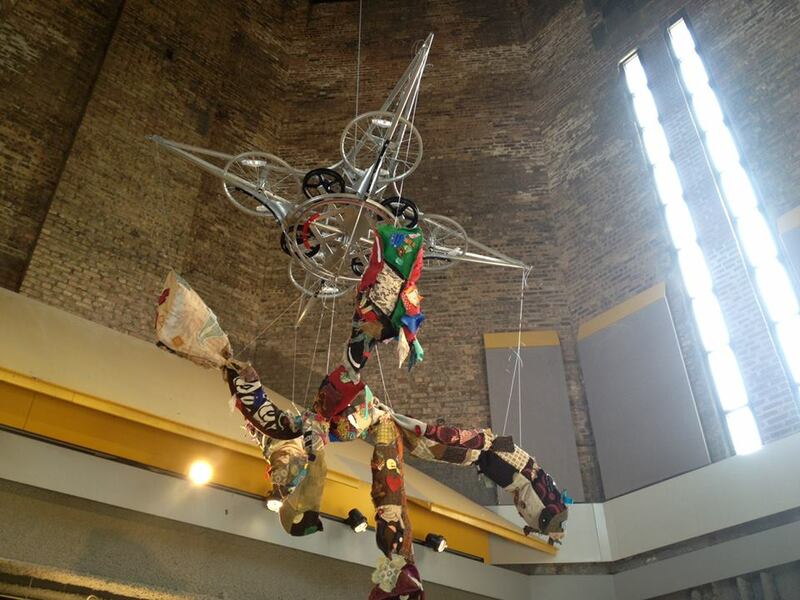 The initial idea for a giant fabric sculpture was sparked by our wealth of fabric scraps, a heretofore unused sewing machine and the Maker Corps Members’ previous work with fabric art. The initial challenge was how to engage guests of the Tinkering Lab in a meaningful program that sparked their creativity. The tinkering began with finding the most effective way to introduce a long-term project. We were constantly adjusting the language we used to spark interest and inspire people to spend time creating. As the sculpture began to take shape the introduction became less crucial. The sight of what we were creating enthused participants. In the end about 100 people added a patch to the sculpture. It is now hanging in the Tinkering Lab. Each of its limbs tells a unique story. A story about how we can figure things out by fooling around. A story about how despite not knowing exactly what is going to happen, we are excited to find out. A story about how when we all work together, even with people we have never met or may not ever meet, we can make something incredible. Read the rest of Dustin’s post at Tinkering School Chicago! 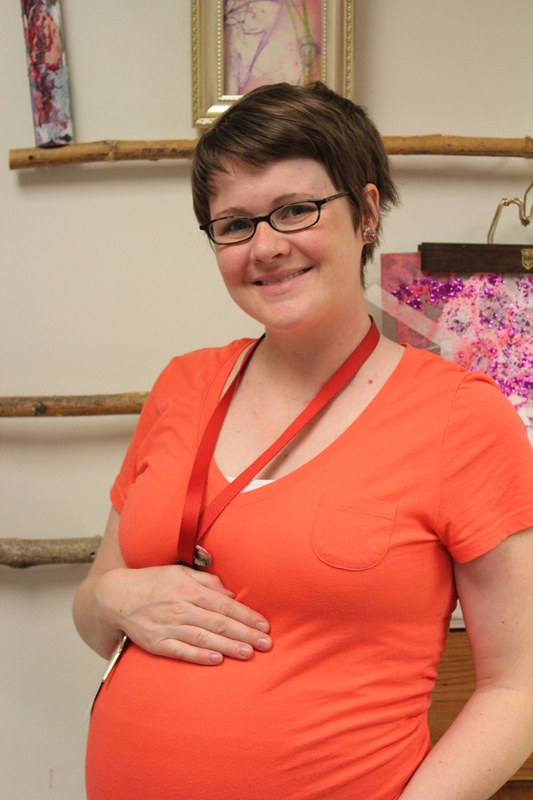 Our Early Learning Program Manager, Mary Sue Reese, is about to get a new title: Mom! Here she shares four lessons she has learned in the Pritzker Playspace that she plans to use in motherhood. Slow down! : When I slow down I am able to witness and support children as they delve into their own interests, explorations, and navigate interactions with peers and caregivers. Be Observant: I love actively observing early learners explore movement, language and investigate simple (and messy!) materials at their own pace and in their own way. Their competencies, personalities and interests really shine through when I’m free of my agenda and tune into theirs. Be Fully Present: As a soon-to-be new mom, I hope that I continue to work on being fully present and provide the space and time for my new little one to overcome challenges, build relationships and make meaning of his/her world. “Do less, observe more, Do less, enjoy more.”: This is one of my favorite quotes and has become a mantra for me when facilitating in the playspace and hopefully will serve me well into motherhood. Introducing the CCM Play Manifesto!